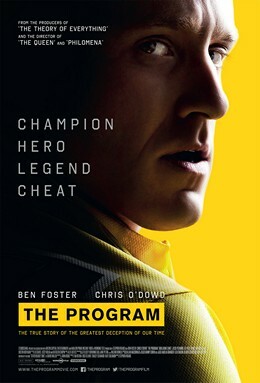 ‘The Program’ is an accomplished biopic from Stephen Frears that struggles to truly get into the head of Lance Armstrong. In the lead role, Ben Foster magnificently inhibits Armstrong, both in physical appearance and in performance, but his performance is better than the film. That’s not to say this isn’t engrossing cinema. ‘The Program’ is still deeply compelling due to it’s experienced director, strong cast and fascinating subject matter, but you can’t help but feeling that this could have been truly great, and instead it is merely good. The film begins in the early 90s, before Armstrong’s cancer diagnosis and shows him as a young up and comer, determined to make it to the top of Cycling at all costs. This is the first time he visits disgraced sports doctor Michele Ferrari (Guillaume Canet), who will go on to give him the advice needed to formulate a sophisticated doping ring that ensured the US Postal Cycling team would dominate the Tour de France for years once Armstrong recovered from cancer. As a successful athlete and a cancer survivor who started one of the world’s largest charities, Armstrong felt he was untouchable, and for a while he was.. The rare dissenting voice was Irish journalist David Walsh, a writer for the Sunday Times who regularly covered the Tour de France. He is played well by Chris O’Dowd, but he always feels peripheral to the action and we never get a true sense of the injustice bestowed on this man (and others) careers and life’s by Armstrong’s actions. Armstrong’s story is fascinating because he’s a man that millions believed in, and despite all the allegations, people didn’t want to admit that this heroic story of man returning from cancer to reach the top of his sport could be false. Last year’s documentary from Alex Gibney, ‘The Armstrong Lie’ came earlier and it did a better job of getting into Armstrong’s psyche than ‘The Program’ ever does. Ben Foster is mindblowing as Armstrong, and the rest of the supporting cast are mostly strong as well, with O’Dowd producing good work alongside Jesse Plemons as Floyd Landis and Denis Menochet as team manager Johan Bruyneel. Less good is Guillaume Canet’s turn as the eccentric doctor Michele Ferrari which verges a little too much into caricature. The film has good music throughout and there is an intensity to proceedings that helps the film to avoid some of the usual pitfalls of the biopic genre, so much so that the ending feels incredibly abrupt. The film makes some knowing winks to the fact that a biopic of Armstrong’s life was mooted long ago at the peak of his success. Little did Armstrong know it would be this one.